Disclaimer before you read this blog post, this is fresh anger and me venting immediately after an incident. These are purely my angry, unfiltered, and unsupported opinions. I know these are vague generalizing statements and that there are both good and bad people everywhere. Please don’t take anything in this personal, and if you are easily offended or upset please read a different post. Unless you have been living under a rock the last few weeks you are probably well aware of the Super Bloom taking place here in California. California is no longer in a drought and thanks to the crazy rain they received this winter, California’s hills, valleys, and desserts and filled with vibrant wildflowers and people have lost their minds. Determined to get that perfect Instagram photo people are flocking to places like Antelope Valley and Joshua Tree to take their best selfie in a field full of flowers, with complete disregard for those flowers. 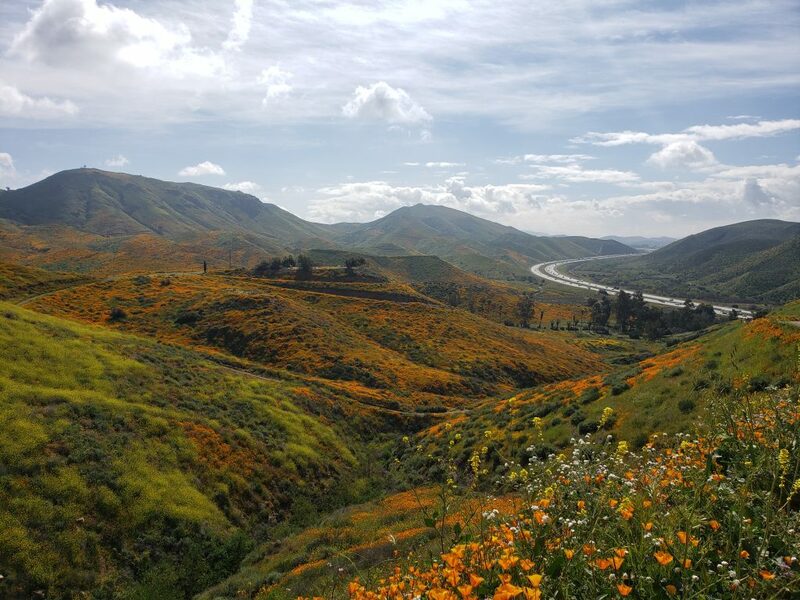 One of the places in the news a lot recently, for their major California Poppy Bloom and the crowds it is attracting is Walker Canyon in Lake Elsinore. The crowds there have gotten so bad that the park was even shut down temporarily. 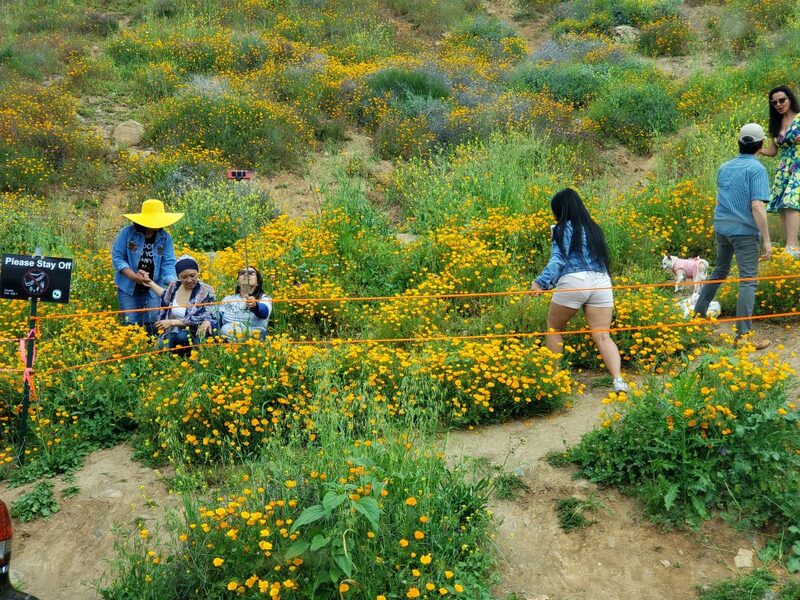 The City of Lake Elsinore is not used to nor well equipped to handle the large crowds the bloom has attracted and even worse, the crowds, determined to get an “amazing” picture, have been trampling and destroying the flowers that brought them there to begin with. To handle the crowds and protect the poppies, Lake Elsinore began shuttling people in on the weekends and limited the use of the main trail to view the poppies. The 4.5 mile loop is now cut off at about a mile up on each side. On top of that much of the trail is roped off with signs telling people to stay out and stay off. I went to Walker Canyon earlier this week to see the amazing poppy bloom and it was breath taking, however the people there ruined it. Before even getting out of my car you could see all the man made trails people had created since the bloom took off. Short little trails all over the canyon, marked by dead flowers to an area where someone clearly thought was social media worthy. 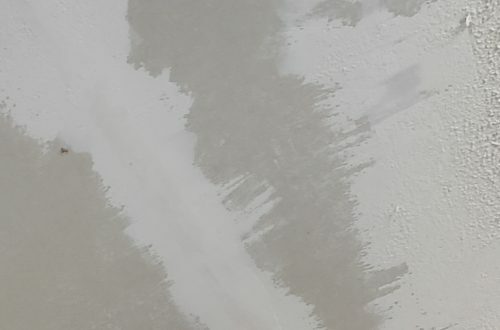 What made things worse and what truly got under my skin wasn’t the damage that was already done, but was the damage still being done right in front of my eyes. Despite all the signs and ropes telling people to get off, everywhere I looked I saw people climbing over or under, crushing everything in their path to take a selfie. People were openly talking about how they came to get the best picture. Hiker One: What do you mean no? That’s why I came. Hiker Two: You’ll mess up the flowers. Hiker One: So who cares? That doesn’t matter and I want my picture. By this point I walked away, but it was hard not to lose it with this person. All along the hike I heard comments like this and saw people with zero regard for these beautiful flowers they had come to see. It made me sick and also made me start thinking about Hawaii and a major difference I’m now starting to see. Although California and people from California have this stereotype of being green and eco-friendly and all about save the planet, a lot of it is just one big show. Now I know there are people that live here in California that really do care about the planet and strive to live green, but for a lot of people here it really sometimes feels like it’s just an image. It feels like so many people here want to look “green” and look like they care about the planet. They want that eco-friendly image, but that’s all it is, an image. They don’t care about what they do to the planet as long as they look good doing it. I didn’t see that in Hawaii. At least not that much. Yes people, tourists and people that live in Hawaii full time, did work hard to get that perfect selfie. You would see people posing on the beach or on the top of a mountain or in a waterfall, trying to get that perfect picture, but more times then not you’d then see them put down the phone, take in what is going on around them and really appreciate the beauty of where they were. When you would go hiking people, I can’t say would stay strictly on the trails, but they stayed aware of what was going on around them, where they were stepping and what they were possibly hurting. You would see trash on the beaches and on the trails, but not like here and you would also always see a clean up group working to fix the damage that had been done. 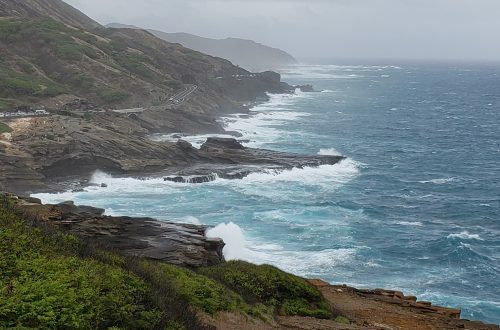 It wasn’t just the city and organizations that worked to keep Hawaii, the beaches, and the trails beautiful, everyday people did there share of the work and it showed. I’m not naive or in denial. I saw people litter and ignore signs. I saw people get too close to wildlife or hurt precious vegetation, but those people were rare and usually had to deal with an angry local. Those with disregard for nature’s beauty were out numbered and it was easy for someone like me or anyone else to stand up and say something to them. It was easy to correct their behavior. And if they weren’t accepting of what you had to say, there was usually another person right up the trail or down the beach that would back you up. I’m normally a pretty shy reserved person and I usually have a pretty hard time standing up to anyone, let alone someone I don’t know, even when they are doing something wrong. 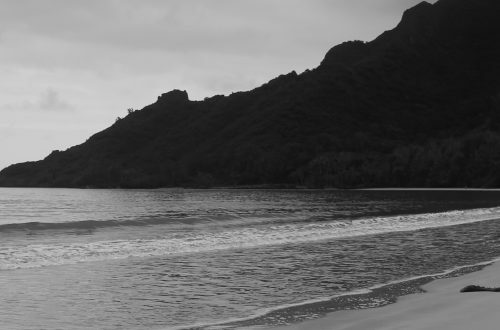 One time I Hawaii, my husband and I kayaked to The Mokes in Kailua. 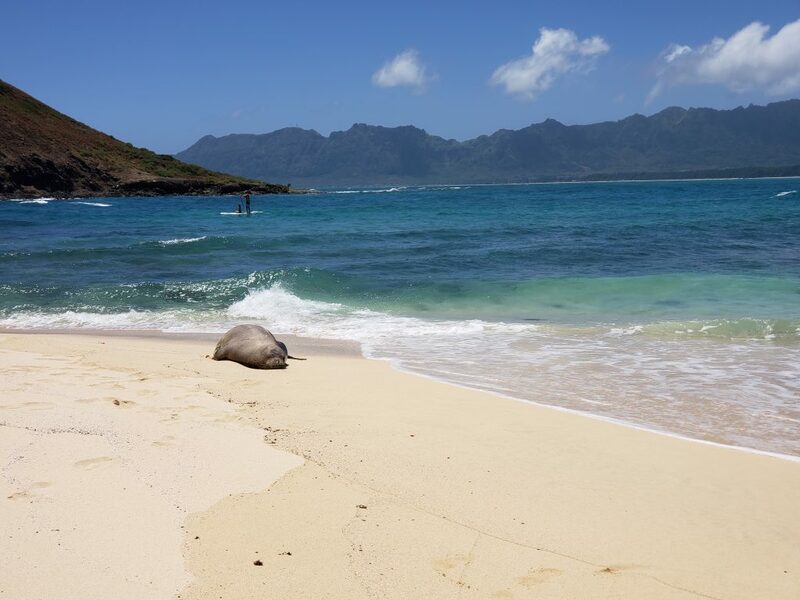 It’s not unusual to see sunbathing monk seals on the little island’s shore. These beautiful creatures are sight to see, but they are also endangered and protected, and you’re not supposed to get very close to them. On this kayak trip, there happened to be a monk seal on shore. As you are supposed to do we took our pictures from a far and went on with our day. Before we left the island some tourists pulled up to shore on their kayaks and decided to park their kayaks no more then 10 feet from the seal. They then preceded to walk up to seal and take selfies with it. Before we even had a chance to say something a lady from another group of kayakers went up to the couple and told them what they were doing was wrong and to please move. They did nothing. Another man then went up and once again explained, a bit more angry, what they were doing was not ok. That still didn’t work. So as the couple took off to explore the island, leaving their kayaks still parked next to the seal, my husband and I went over, grabbed their kayaks and drug them away from the seals all the way to the other side of the beach. The other group cheered and threw shakas. I don’t think that would happen here. I’m almost positive that wouldn’t have happened at Walker Canyon. If I would have said anything to anyone they either would completely ignore me or stop while I was there and continue on once I walked away. The concerned were clearly out numbered by the unconcerned and that is sad.